Many of you are familiar with the success of the LifePump, but did you know that the LifePump story has actually been in the works for more than 40 years? We want to share with you how the LifePump came to be, and for that we need to rewind a bit! Below is Part 1 – featuring the incredible story of Chris Walter, whose experience in the Peace Corps eventually led to major connections for Design Outreach. For California native Chris Walter, passing by a Peace Corps information table in the middle of the U. C. Berkeley campus in the 1970s would be a turning point in his life. Little did he know, that moment—and the passion that followed—would help pave the way for the work of Design Outreach, a Christian humanitarian engineering nonprofit dedicated to developing innovative solutions that help break the cycle of poverty. Walter, now a software company professional living in San Jose, was studying geography at the time, struggling to determine how he wanted to use his degree. Having a hunger for adventure but little idea of what he wanted to do long-term, he stopped by the Peace Corps booth and spoke with recruiters—a conversation that would land him in the heart of the Central African Republic. PCV Tim Crow (beard) and Christopher Walter are volunteers with a mobile, small bore hole well-drilling team. They work together with the mobile drilling rig, using augers to drill a 4-inch hole which they will fit with a two inch pipe to provide clean drinking water to the community of Batangafo. Small bore holes can be dug more quickly and less expensively than the open, traditional wells, can go greater depths, and are less susceptible to contamination. Those two years, Walter says, were life-changing. The exotic African culture, the break from a materialistic American way of life, and the confidence that his time was being used for something worthwhile ignited his passion for providing clean water for the 663 million people across the globe who go without. With a newfound passion for improving water access in developing nations, Walter searched for jobs that would give him the experience and qualifications necessary for full-time work in international aid. After doing hydraulic analysis for a geophysical engineering company, he landed a job at Robbins & Myers, a diversified manufacturer that was looking for a French-speaking person who wanted to be in Africa. The company had just started a new international division that supplied progressive cavity pumps to developing markets, and they needed on-the-ground support. Walter was the perfect fit. “I found them, and they found me,” he says. 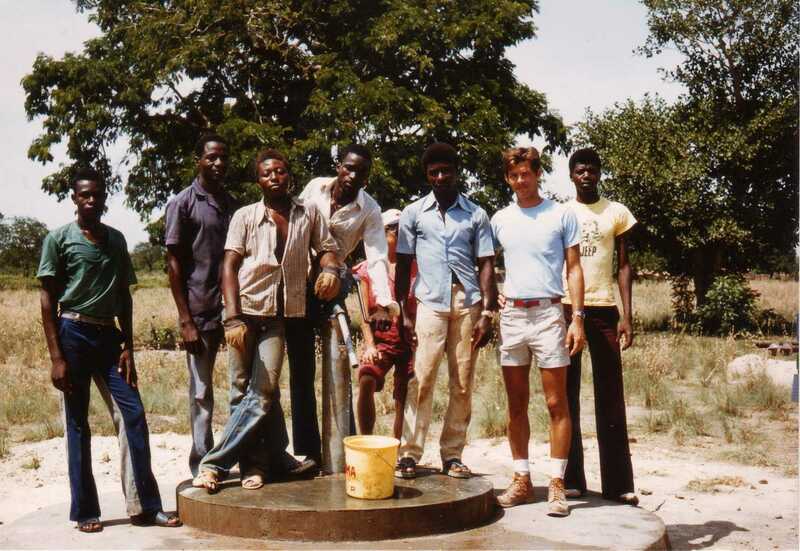 During his four and a half years with Robbins & Myers, from 1981-1986, the new field service engineer—and later the manager of marketing and distribution—would make 19 three- to six-week trips to Africa to troubleshoot the hand pumps, meet with project personnel and funding agencies, and work with local manufacturer representatives in countries across the continent he had come to love. These pumps, unbeknownst to Walter, would long outlast his stint with Robbins & Myers, providing clean water to hundreds of people for years to come. From 1981-1990, the United Nations (UN) designated The International Drinking Water Decade, a period when international organizations joined forces to provide access to clean water and sanitation worldwide. According to The Global Development Research Center, this decade of awareness and heightened efforts provided clean water to more than 1.2 billion people and sanitation to about 770 million. During this time, Mike Dillon, current president of German pump manufacturer SEEPEX and Walter’s former boss at Robbins & Myers, was involved in the development of a progressive cavity hand pump that was instrumental in the UN Water Decade’s goal of improving global water access—the same type of hand pump Walter had helped troubleshoot for his nearly five years with Robbins & Myers. These pumps were durable, long-lasting, easy to use and different from any of the other hand pump technologies available at the time. But despite the clear benefits, production would soon cease. Just as the Peace Corps had stopped receiving funding because of volatile conditions in the Central African Republic, the operation of which Dillon was a part came to a close because of high production costs and competition. For nearly three decades, the passion that Walter and Dillon shared for changing the story of the millions of people worldwide who lack access to clean water would still simmer. Walter took jobs at software companies that would allow him to continue to travel to developing countries, and Dillon clung to his progressive cavity hand pump literature hoping that the pump he had worked so hard to develop would one day be used again. In late 2011, Walter was browsing social media when he came across a photo that caught his eye. The photo was posted by Jim Hocking, founder of an organization dedicated to serving people in central Africa by providing clean water and the hope of the Gospel. Called Water for Good, the nonprofit works primarily in the Central African Republic, the same area Walter served during his time with the Peace Corps and the same place where Design Outreach CEO and Co-founder Dr. Greg Bixler and his team of engineers began work on a new hand pump that would overcome the challenges faced by other pump technologies in rural communities. Some hand pumps last only six months before breaking down, and some estimate that a third of the world’s hand pumps no longer work. This knowledge is what pushed Bixler and Co-founder Abe Wright to use their engineering skills to develop an innovative pumping solution to help reverse these alarming statistics. 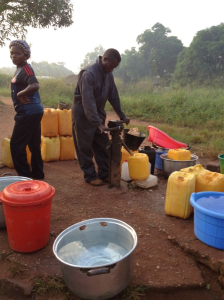 The photo that Walter saw on his social media news feed depicted a Robbins & Myers hand pump still in operation in the Central African Republic—the same type of pump he had worked with decades prior and the same type of pump that inspired the Design Outreach team to develop the LifePump, a progressive cavity hand pump designed to provide even the most remote villages with a safe, reliable and sustainable source of clean water. 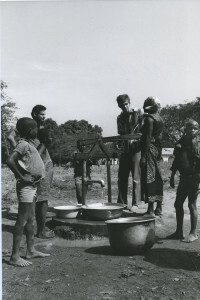 After seeing the photo that reminded him of his own time in central Africa, Walter reached out to Hocking, and the two discussed their connections to others working in international water supply. Walter knew Dillon from his work with Robbins & Myers, and Hocking knew Bixler and Wright from his association with the Grace Brethren Church and their shared connection to the Central African Republic. Both Walter and Hocking were enthusiastic about the use of progressive cavity hand pumps, having seen firsthand how many of the early Robbins & Myers pumps were still functioning 30 years after installation. Knowing that Bixler and Wright desired to engineer a sustainable pumping solution that would outlast traditional hand pumps, Hocking told Walter about the work of Design Outreach. Meanwhile, Bixler and Wright knew they wanted to develop an improved hand pump modeled after the Robbins & Myers pump used in the Central African Republic, but they didn’t have a manufacturing partner to engineer the parts. 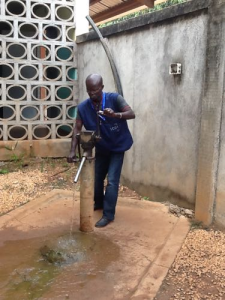 After extensive testing of a prototype in the Central African Republic, Bixler and his team knew that the hand pump project would require a reputable company with quality manufacturing capacity that could engineer and manufacture a couple specialized parts. “One thing we realized at the end of the testing period is that we needed to make an optimal progressive cavity pump element or the project was not going to work,” Bixler says. In an effort to track down a suitable partner company, a Design Outreach volunteer had been researching companies that might be able to provide the pumping elements—the rotor and the stator. But no one seemed to be interested. Still, the volunteer sent information about Design Outreach’s LifePump project to the SEEPEX office in Enon, Ohio, hoping it would catch the eye of someone there. Just when the Design Outreach team, also based in Ohio, thought the search might be fruitless, Walter reached out to Dillon, encouraging him to be a part of the LifePump project. As a result of the connection that Walter helped facilitate between Design Outreach and SEEPEX, the LifePump became a reality and enough have been produced to serve an estimated 27,000 people in Africa and Haiti with implementing partners World Vision, Water for Good, and ODRINO – through a 7-country pilot program to prove field-readiness. Results have been very positive and are catching the attention of prominent NGOs and high level Ministry of Water and Irrigation officials. Designed to reach depths of 325 feet, the LifePump can draw water from locations where other hand pumps have failed. Its durable construction and ergonomic design make it ideal for remote areas where women and children are primarily responsible for gathering water. While the LifePump was inspired by the Robbins & Myers pumps that Walter and Hocking worked with during the UN Water Decade, Bixler and his team of engineers have labored to perfect the design. For Walter, knowing that the connection he helped facilitate has led to the production of 68 LifePumps for Africa and Haiti is both comforting and inspiring. The inventor of the famous 6500 microprocessor is interested in inventors and third world water pumps. Bill Mensch, lives in Arizona, USA and his company is the Western Design Centre. He appreciates fundamental design concepts for the doing of good, as oppose to being either legally controllable or of the latest high tech. Seems we are on the same track, the difference being that we developed a more “African” solution, the “BluePump”, based on the success aspects of the already existing Volanta pump, which can be easily maintained by any local Area Mechanic with just a few tools. This is very important to secure long time support and to keep the long term operation cost low. We are in fact a “Social Enterprise” independent from any donor, we received no funding to develop the BluePump, other than NGOs bought BluePumps to try it out and coming back to us because the people in the field asked them to so so for more BluePumps. So far there are over 1.000 BluePumps working in over 10 countries in Africa. The success of the BluePump is mainly based on it’s own performance and a strong reliable network of professional dealers, we do not have fancy promotion campaigns. Maybe we could share efforts?